This tax season, Americans appear to be bucking their spender reputation, choosing to sock away any money they get back in tax refunds, recent Morning Consult polling shows. Fifty-eight percent of Americans also reported that they filed their returns in March or earlier, weeks ahead of the federal government’s April deadline — perhaps because 53 percent of them were also expecting to get some money back. 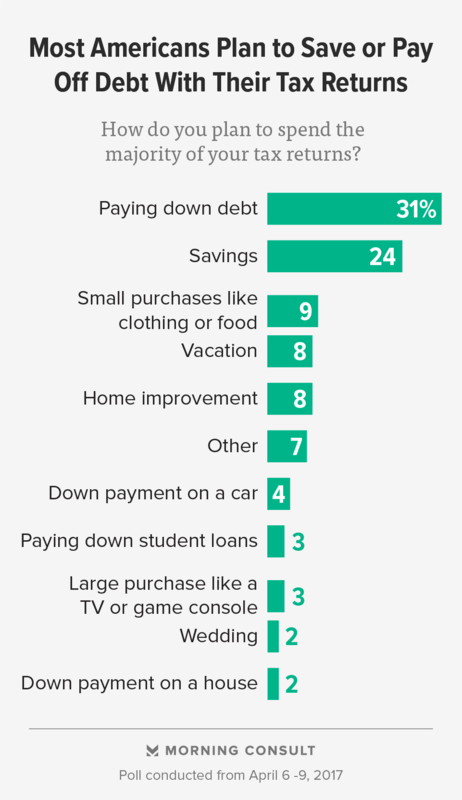 Three out of 10 respondents (31 percent) said they’re using that refund to pay down debt, and 24 percent said their refund is going right into savings. Those figures were at least triple the percentage of Americans who say they plan to use that money toward home improvements, vacations, down payments, or other purchases. 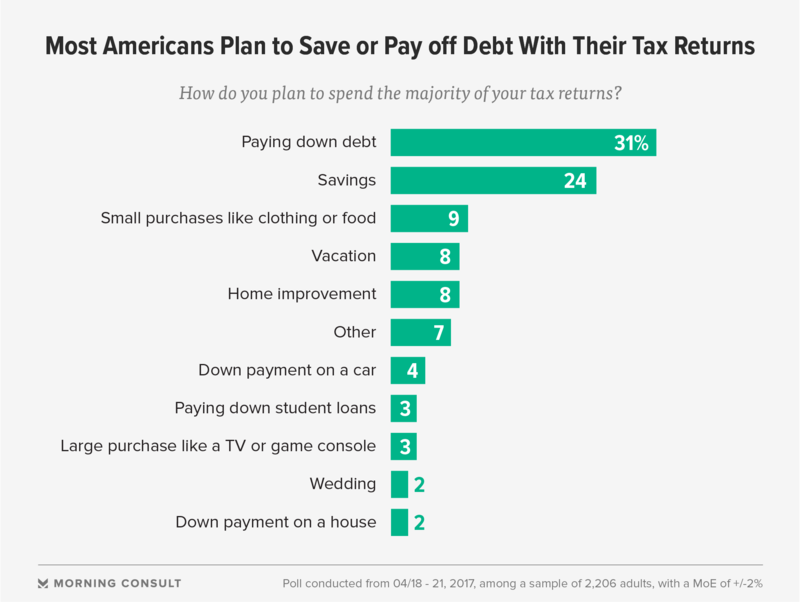 And the results hold across the generations: 28 percent of those aged 18-29 said their tax refund is going toward savings, and another 19 percent said they’re using it to pay down debt. Among those 65 and older, 35 percent prioritized debt relief above savings, and another quarter are flagging their refund for savings. Even among wealthy Americans, saving money they get back from the government is a top priority. Nearly 4 out of 10 people (37 percent) who make at least $100,000 annually said their tax refund will be put in savings, and another 27 percent plan to pay down debt. Lisa Featherngill, from wealth management firm Abbot Downing, said people may be particularly eager to pay down debt this year, as their interest rates are expected to rise. In fact, between spending, saving or debt relief, the “highest rate of return is going to be paying down debt,” she said. While Americans report that they do not plan to spend their tax refunds on big-ticket items like vacations, market research suggests daily spending habits are likely to continue unabated. According to Kiplinger’s April Retail Sales & Consumer Spending Forecast, retail sales should increase even more this year than they did in 2016, despite some weakness in car and restaurant sales. Morning Consult data on Americans’ holiday shopping habits also backs up the nation’s penchant for spending: While people said they don’t necessarily like the long lines or early hours of an annual event like Black Friday, they admitted to taking part anyway, in part because of their love for the steep discounts. Polling was conducted from April 18 through April 21 among 2,206 adults. See full results here.